This week's assignment is very similar to last week, except this time you just sew pairs of pairs together. Sew some pairs side by side, sew some pairs end to end. You can sew 3 little pieces in a row, then add a string to one side....any way works. Make some of each! flipping the piece on the right places the yellow next to the dark blue green. It looks much better the second way, so I sew it up! Now, don't overthink each step. 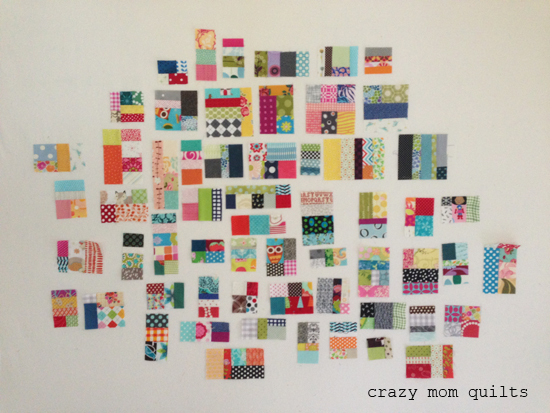 If you do, this quilt will drive you crazy, because there are about a million decisions in a scrap vortex quilt. BUT, auditioning your options is a good thing! It's a fine line some days. Ha! Here is an example of building with slightly larger blocks. When I was pairing smaller blocks up, I noticed that these two blocks were sitting next to each other. They were in progress from a previous sewing session. They are roughly the same length and the colors work well together, so I sewed them together. The edges of this block are pretty tidy, so I won't trim this block at this point. I'll just add it to the temporarily done pile. Here is what I accomplished this week. Not a ton, but it is progress! It is kind of slow going at the beginning, but once you start adding blocks together, you will gain momentum! I like to place my blocks on the design wall as I complete them. It's encouraging to see progress! Q: My scraps don't all "go together", so how much should I edit? A: My advice to you would be to edit based on the tone of the fabric more than anything else. If you have a lot of scraps that are in more traditional colors vs. the candy colors (what I tend to use) I would separate them into two different categories. Also, don't take out all the darks out of the equation (that would be my tendency), because the quilt needs the variety of values. The darks add interest to the quilt. At the end of the day, YOU need to decide what your comfort level is in editing your scraps...after all, it's your quilt! 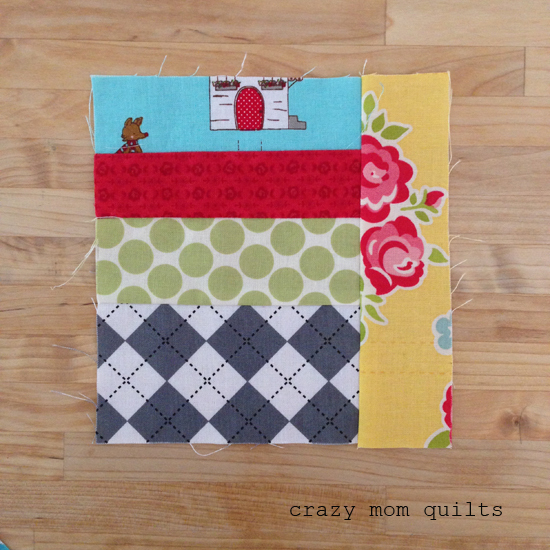 Q: Will there be a linky party for the quilt along? A: I don't think so, but if you want to share your progress, you can use the hashtag #scrapvortexqal, if you are on Instagram. Q: How big is the largest scrap in your quilt? A: I had to go check, but I found one (the green strip shown above) that is about 2 1/8" x 7 1/4 long. That's pretty big for me, but you can use any sized scraps you want! Q: How do I sign up for the QAL? A: This quilt along is very informal. In order to join, all you need to do is leave a comment (or not) and sew right along with me following the directions that I post. Easy and fun! If you have a blog, post about your progress! Or use the #scrapvortexqal hashtag on Instagram. Q: How long will this QAL run? A: Probably through the month of June, maybe into early July. We will see how things go! Ok, that's all I have for this week. If you are quilting along, please let me know how your quilt is progressing! If you have any questions, I'll try to answer them in the comments (or in the next post). Just got started last night but Iam loving it! Thanks for part 2. I am having a great time revisiting some of my previous quilt fabrics, enjoying them and now putting them into a quilt. I am trying to sew this outdoors as we have some great weather in Wisconsin. Just need to turn down the wind a bit as scraps sometime take off flying across the yard. But then my side kick cat has something to case. Have a great week. I have a nice layout of pieces that is about 48" by 48" so far. I too had wondered about the size of your scraps. Some of mine are larger but I trim them down into 2 or more pieces and re-use elsewhere in the quilt. I like the look of your smaller bits. Thank you! You have such fun scraps!! I started last week and didn't get too far but I love the freedom this type of quilting gives as I can do just a few minutes or an hour depending on my time available and I don't have a lot of set up so I can pick it up instantly.... this may be a long drawn out project for me but will be totally fun! I've recently been making a few quilts and have just added new scraps to my scrap buckets so I need to add those in too! 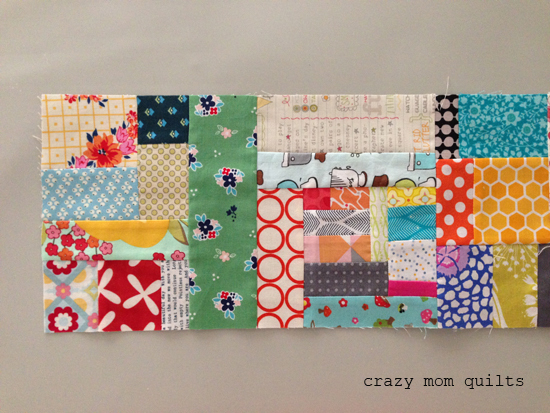 Love the scraps, and your progress is always beautiful. I'm planning to join andn started sorting out my smaller scraps last night. I realized that the majority of my scraps are larger pieces, so I'm guessing I'll be cutting them down at some point into multiple pieces. I like the smaller scrap version you've created best. Thanks again for the tips and starting this QAL, I'm hoping it's the perfect summer project for me. Thanks for Part 2, been waiting impatiently for it to appear today! Oh no, I think my scraps are too small. It will take me forever to make hundreds of blocks! Never fear, I have more scraps. Time to break out the bigger scraps! Yay for the next step!! I managed to make a pile of pairs one day last week when I was too tired to quilt my current project; it was an easy break that let me keep sewing. :) Looking forward to growing my pile and making pairs out of pairs! I have some random small blocks, or parts of blocks that I am adding to mine. I also made a quilt using 1/2 square triangles that finished at 2.5 inches. I am adding these to mine, just to see how that looks. Really want to get rid of some of my scraps and this is fun! I'm a week behind as I just started sorting my scraps. This is a great idea and will be fun! Thanks for the really helpful photos and advice. I have made a start and blogged about it too - so no going back! 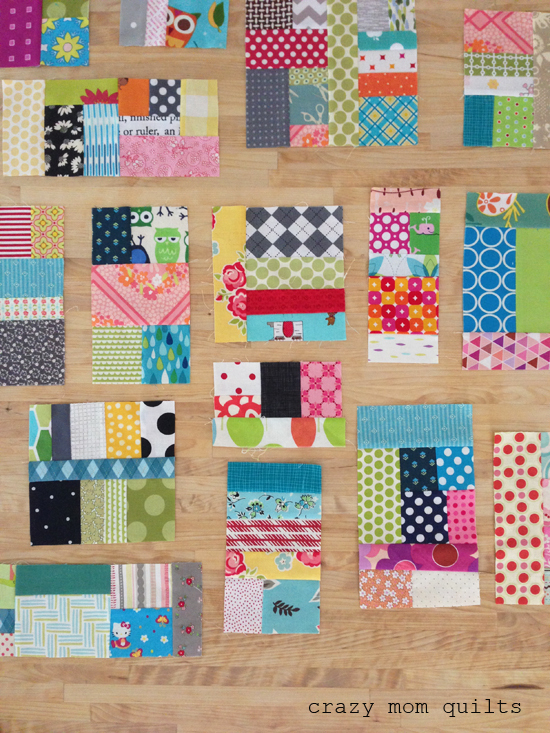 Such a beautiful and colorful scraps.Love them all! Do you square up or trim the edges after each addition to the blocks? This is just what I needed to bust through some of my scraps and have fun in a no - pressure way! Ok, I'll be honest. I haven't really started yet, but I received some scraps the other night and did sort some for this project. Does that count? This is fun and I can see it is going to take a while for me. I am using my crumb/string scraps so some of them are fairly small. Most of the bigger pieces get cut into uniform sizes, but I have a lot to choose from. Spent a few hours working on them over the passed week and haven't even put a dent in my two scrap baskets and the one 2 1/2 gallon zip lock bag I have for these smaller scraps but I am enjoying it. I have enjoyed sewing together some of my leftover scraps. Easy to do and no worrying about if they will go together or not. I'll get busy sewing some more and also jump into Week 2 and watching those tiny blocks grow bigger! I just started last night. I sorted thru my scraps and put the ones I wanted to use in a bin. I sewed and sewed... I think the scraps in the bin are breeding because the pile does not seem to be going down! 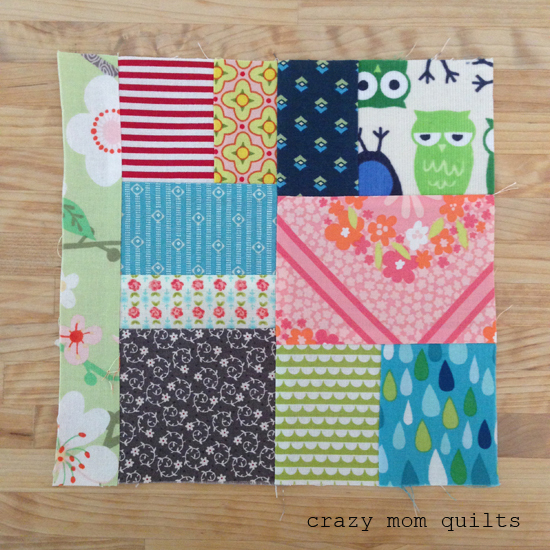 I may be getting ahead of myself but do we sew the scraps into a block size or just random size blocks ? I began the quilt along with you last week and then had to leave town for 2 weeks, BUT, I am hoping to catch up. 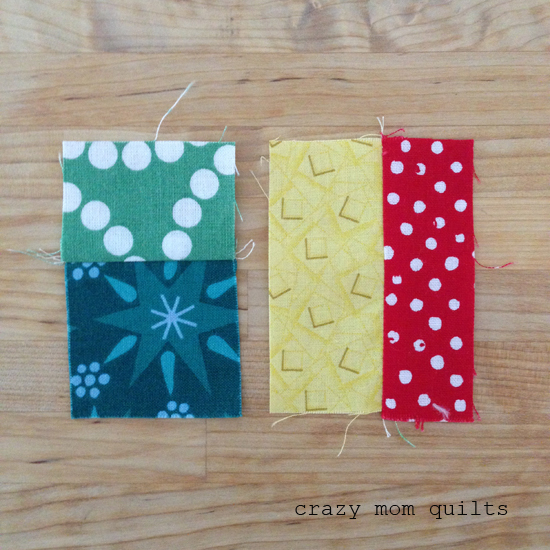 I love this process and have so many scraps to use! I still sorting scraps but enjoying watching how this scrap project progresses. Your photos are always so lovely and bright - real eye candy! I better join, I have too many scraps. Well, I'm "in," and have been working steadily on sewing pairs together, some of which have to get cut up before their sewn to another piece. 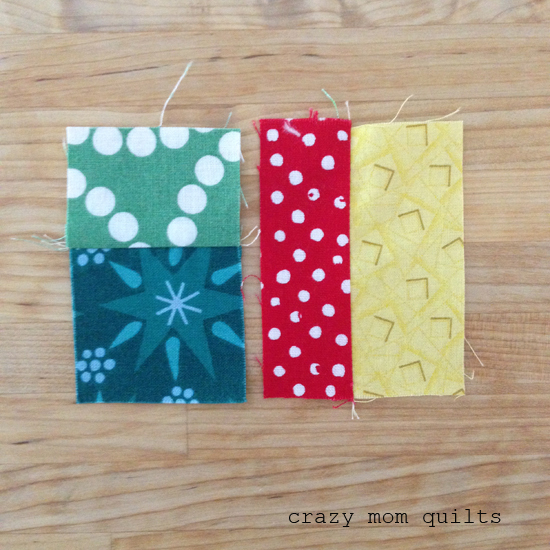 This is fun, and mindless - a great way to sew. Just wish you'd been HONEST and told us what a mess this makes! (Ha, ha.) Hopefully, by the time the quilt top is put together, the mess will have subsided and a few containers will be lowered. Thanks very much for your motivation and posts! Looks great! I need to get started on mine! I'm a week behind but getting started! What do you think about adding in small pieced blocks - like leftover wonky cross or whatever - I'm thinking of just including those randomly. Thoughts? Going to love this project. 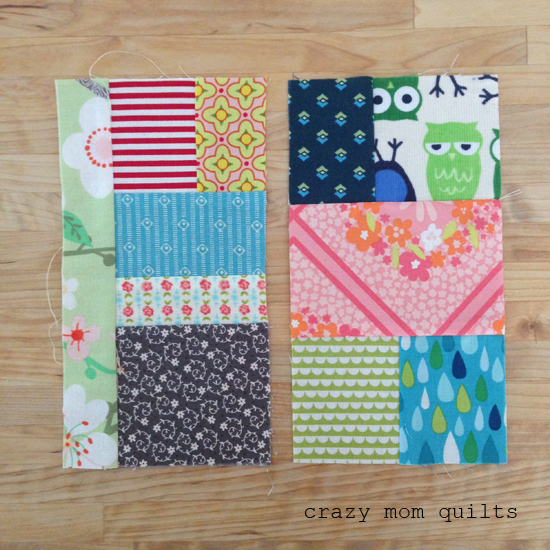 Can't wait to begin putting scraps together and it is a great looking quilt in the end. I started with the crumb bucket, so I will take much longer to get to a useful size, but I'm having lots of fun. I'm using some very dark bits & very light too. Hoping for a sprinkled pepper look in the end. Yay for Step 2...been waiting with baited breath! I'm so glad to be using my small scraps. They're piling up. I think this is the perfect summertime project to work on here and there! 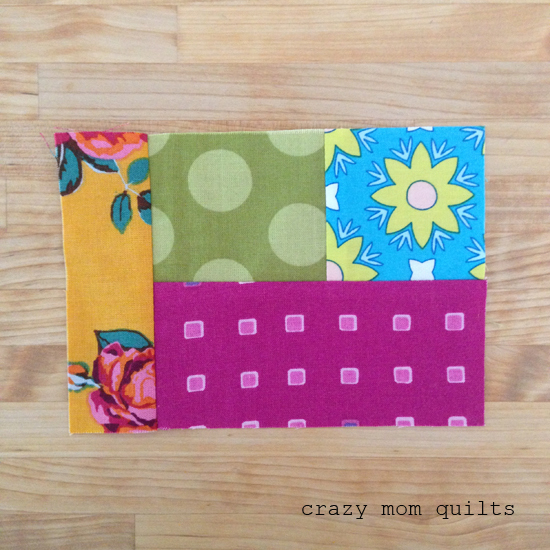 As soon as I signed up last week I took to the sewing room and put together some of my easy scraps. Tonight I am sequestering and getting a bunch of the more difficult ones done. Then I'll be ready for this week's step. Maybe I'll sew until two in the morning! Who knows with a thing like this?! 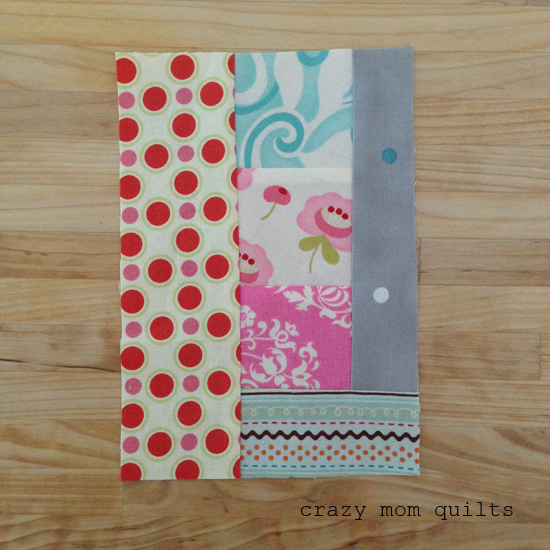 Thanks for the QAL- I'm loving using up lots of scraps! I appreciate how you showed the different ways to place colors next to each other for maximum impact. It helped me to slow my process and view pieces from several angles before sewing together. Your pointer about keeping some dark pieces was also helpful. Initially I had edited my darks out but after including them, I'm really glad I did! Loving the result!! Keep posting inspirational ideas. So, so pretty. Found lots of piece of rectangles unused from a prior project, all miniatures. Your block reminds me of tiny log cabins. One of my favorite blocks. Ready to start now. Loving Part 2. Just found info about your QAL today! I can't bear to throw anything away so I have 30+ years of scraps to pick from. WooHoo! Can't wait for the next set of instructions. Hoping to get started this week. 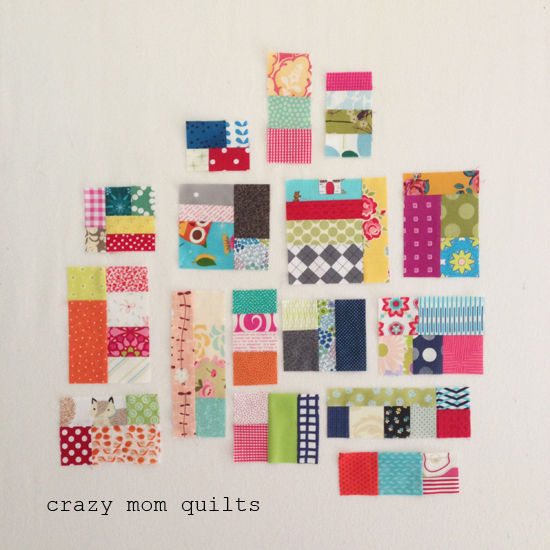 I love scrappy quilts and this is such a fun one with mostly just sewing!! Love it! This is just what I needed!!! 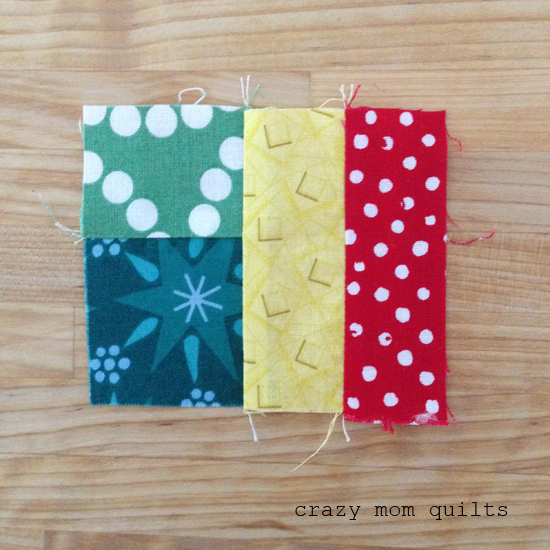 An idea for my leftover scrapsblock from another scrapquilt. So I´ll follow this tutorial and I´ve already mentioned your blog with a link on my blog. I would say stick to the random size blocks for now! Good question! Yes, I trim off the overhanging edges from the blocks as I make them. I don't get too fussy getting them exactly square or rectangular, but close. I hope that helps!